Designing your luxury bathroom Oak Park style has no limits. Making your mind up as to the choices you want to remodel your bathroom with shouldn’t be limited either. Your imagination is the only limit you’ll find when you call H&A My Design. We are the leading bath remodeler in Oak Park over the last few years. We think bathroom remodeling is one of the most important remodeling projects because of the status your bathroom has today. Gone are the days where it was just a utility room. The concept of the luxury bath has grown so much, it has become the room to relax in. We redesign a space to blend into your lifestyle. Because bathroom remodels are the new and stylish home luxury retreat, people are taking advantage of everyday luxury over spa retreats once in a while. Because of the interest from the public, prices on luxury spa baths have come down considerably and are now affordable for everyone! You are going to love what you can do with your bathroom remodel design! We want you to dream big. For bathroom design that’s the only place to start. With today’s materials, you’ll be able to get any look or feel you want using a variety of materials. Your finished design should make your bathroom the place you want to relax in. All the of choices of fixtures, vanities, and patterns will dazzle you. Let’s build the luxury bath you dreamed about. Let’s make it uniquely yours. 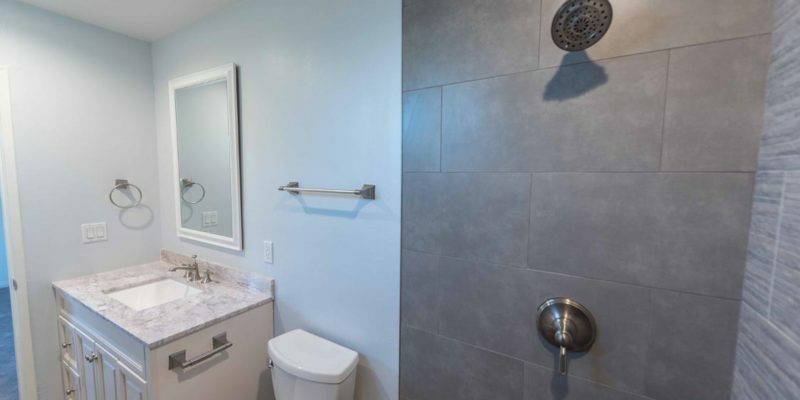 You can start looking into bathroom remodeling by looking at photo galleries of bathroom remodeling projects using your internet connection. You can really have a lot of fun doing this. When you find the concept you want to work with, our designers can take your ideas and make them your own. Let’s make your design unique and really show off your own personal style. For many people today, what you can do can be as much fun as using the luxury bath fixtures. Today’s internet of everything technology adds bluetooth to virtually everything in your luxury bath. You can now have it all and control it with a single remote. This is the future and it’s something you want to explore. The best part is it costs less than you would imagine. You can even prepare it for upgrading later. This makes adding new features becomes very easy. A lot of these added features can add eco-friendly features. They are designed to monitor and conserve on energy use. H&R My Design bathroom designers will guide you through all of this. We’ll show you the choices that will make your remodel an eye-catching sensation. Discover the luxury your new bathroom will deliver every day. Pamper yourself in your new luxury spa right at home in Oak Park. We believe your bathroom remodel in Oak Park will be one of the best decisions of your lifetime. Call us and let’s make that dream come together today. H&A My Design is waiting for your call.